Many children have a fear of visiting the dentist. What can you do to make this visit less stressful and even enjoyable for your child? Following are some steps that we have found worked for children, even those who seemed terrified at the prospect of walking into a dental office. We suggest a family member visit a children’s dental office to talk with the office staff about their child’s fears. Often the receptionist is happy to greet the child by name when he or she takes a tour. This puts many children at ease. Take note of the waiting room for items that will catch your child’s attention. Are there special books, trucks, games, or stuffed animals that will appeal to your child? These can be discussed when you describe the office to your child. Often pediatric dentists will offer small prizes, balloons, etc. This will often be an incentive for your child. Next, make plans with the office staff for your child to simply tour the facility. Your child can play for a bit in the waiting room, see the special chairs, and hopefully note that other children seem happy. Often just experiencing the office, without the stress of having to open their mouth, will help many children. Playing with an oversize toothbrush to clean a stuffed animal's teeth is a fun experience! For those children who are exhibiting extreme fear, begin by scheduling an appointment where a hygienist simply brushes their teeth. Your child can understand what it feels like to sit back in the chair, perhaps wear silly sunglasses as the light shines in their eyes, and hopefully gets a choice in toothpaste flavors. Letting children have choices makes them feel empowered and helps lessen fear. 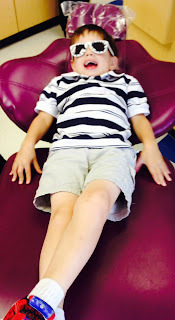 Although scared, this child agreed to sit in the chair because he could put on silly sunglasses. When the appointment is over, play dentist with your child at home. You can be the patient and your child role-plays as the dentist or hygienist. 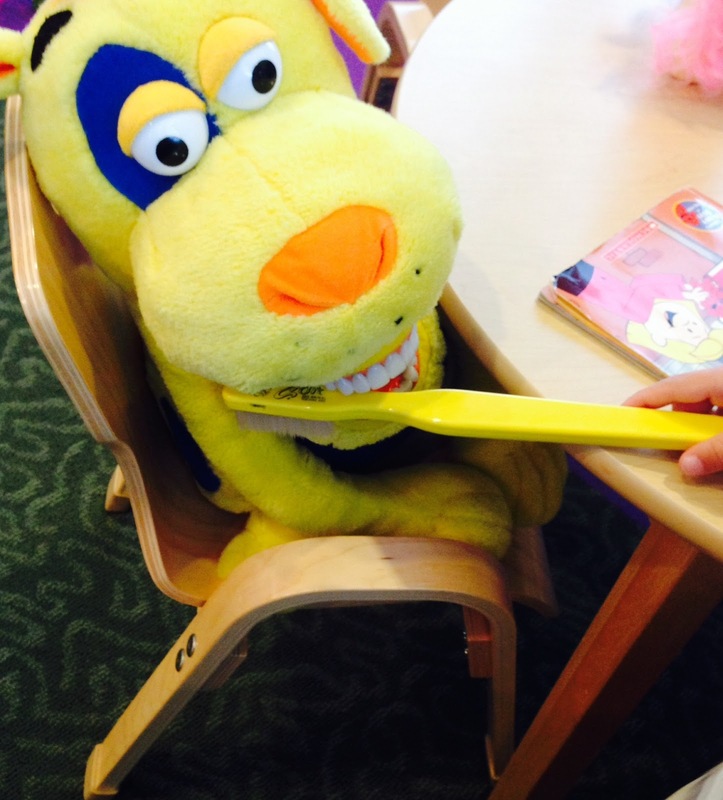 You can set up a pretend dental office with stuffed animals as patients. We have seen these simple suggestions turn a terrified child into one who asks, “When can I go the dentist next?” And that is what we want! We encourage preschools, daycare centers, camps, etc. to share this post with families. This dentist recently replaced my old veneers with ease and great success. It has been a pleasure dealing with a real professional dentist Manhattan Beach. He did excellent work.